- 【Use it As An Independent Phone】: If you put a SIM card into the smart watch, you can use the smart watch to make calls and send text messages like a mobile phone. No need to connect it with a mobile phone by Bluetooth. 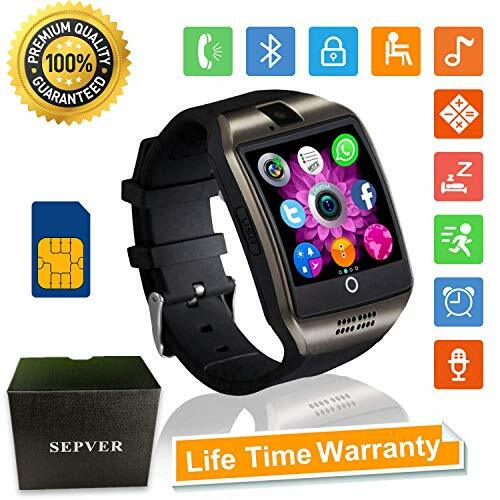 - 【Work With A Mobile Phone】: if you connect the smart watch with your Android phone, you can use it to check your updates, receive texts, messages and notifications of APPs (such as Facebook, Twitter, Wechat, Whatsapp). Make and answer calls by the smart watch without taking out your phone from the pocket. No need to put a SIM card into the smart watch. For iPhone, this watch can only sync calls, can not sync messages and notifications. - 【Maximum Compatibility】: Compatible with all Android Phone & IOS phone, such as Apple iPhone, Samsung, Google, HTC, Sony, LG, Huawei, ZTE, Oppo, Xiomi, Vivo, One Plus, Lenovo etc. - 【Main Functions】: Make calls / Answer calls, receive messages / send messages, sync messages and notifications, pedometer, sleep monitoring, sedentary remind, Image viewer, Audio player, Remote capture, Alarm, Two way Anti-lost, Phone book, calendar, calculator, world clock. All functions work for Android phones, but for iPhone not support below functions: sync messages, sync notifications, Anti-lost. other functions work as well as Android phone. - 【Life Time Warranty】: 100% Satisfaction Guarantee, Free return without worry within 30 days. We promise you every quality smart watch and friendly customer service. You can also see our product video on Youtube to learn how to use it.